A year ago today, some 200 Rangers fans gathered outside Madison Square Garden for a Fire Glen Sather rally in which they stated grievances against the Rangers' general manager and called for his ouster. Since then, the Rangers missed the playoffs for the first time since the lockout — but have also seen a new crop of young players make an impact at the NHL level. The rally's organizer, Mike Zippo, spoke with The Sports Section about whether his opinion of Sather has changed over the past twelve months. 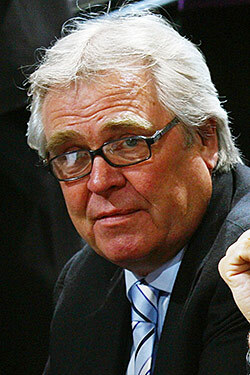 A year later, do you still think Glen Sather should be fired? Has anything changed over the past twelve months that made you reconsider your position? Well, he's certainly been doing a better job as of late. He's cleared some cap space, he hasn't given away prospects or picks, and the team is young, competitive, and fun to watch. Just to clarify, since you say you think he's been doing a better job of late, do you no longer think he should be fired? Well, I think that his track record speaks for itself still. Since he's been here we still haven't made a lot of noise in the playoffs. While he has turned things around a bit this year, I'd still love it if we went another direction in the GM position. Do you think Sather has a long-term plan? After all, there appears to be a commitment to building this team largely from within the organization and giving kids the chance to develop in the NHL. It surely seems that way. A lot of the team is homegrown and we have some more good players coming. I still think we do need a center to play with [Marian] Gaborik, though. Do you consider this year's team to be more likable than previous ones? A couple of Sather's more regrettable signings are no longer on the NHL roster. Does that make a difference? Well, they're fun to watch. There are going to be some growing pains since they're a young team, but they've had a good year. We are not a Cup contender, but I think making the playoffs is very important. These guys need to get a taste of the playoffs and gain some experience in the postseason. What did you think of what Sather did, or didn't do, at the deadline? How important do you think it is to be competitive in 2011, as opposed to building toward something in the future? I liked what he did. Like I said before, he didn't give up prospects, but he was able to bring someone in like [Bryan] McCabe to be a bit of a mentor for the younger guys for the rest of the season. It is very important for them to be competitive this year and make the playoffs, but they didn't need to overpay and mortgage the farm for a rental. They're still a ways away from winning a Cup, I'd think. You'd mentioned to Puck Daddy in January of 2010 that you thought Sather would make a "stupid trade" and deal away prospects. But as you said, he's avoided making that kind of trade. So I guess my question is this: How much confidence do you have in Sather now? How has that confidence level changed over the past fourteen months or so, since that interview? As long as he doesn't have his checkbook open on July 1, I think he'll be okay. He has made some great trades, but a signing like the [Derek] Boogaard one makes you scratch your head.